I’ve had good results using two inverted V linked dipoles. That’s right two poles and two inverted V antennas with a coax switch at the rig. I will have the same set up at Mt Ginini. To save weight you could easily mount two inverted Vs on a single pole. One inverted V broadside E-W and the 2nd broadside N-S.
Is that what is also known as an Inverted-L antenna ? It’s just a standard coax-fed dipole really, with a choke consisting of half a dozen turns of RG58 on a 100mm diameter plastic container at the feedpoint. One leg goes up the pole and the other goes out horizontally - I support the end of the “outer” on a convenient fence or a guyed walking pole. With my 7m pole it ends up about 1.2m above ground. Limited trials suggest that extending the “outer” in the direction you want to be aiming at does perceptibly improve signals from that direction but given the vagaries of propagation that’s a very subjective assessment! OK, understood. I had to do that on my 20m J-pole antenna as the mast wasn’t tall enough - I “thought” there was a slight directivity in the direction away from the direction that I ran the bottom of the L out - I suppose it could of course be in both directions. I later also tried with running the top of the antenna through a plastic loop and then sloping off with a cord to to a fence post - that “inverted-L” didn’t “seem” to work as well as the “L” - of course all of this was affected by how the band was at the time, not really a scientific comparison! I hope to have the VP2E working for this S2S event. It a long way out, but April-May are the best months to get into VK from here. I have worked 20 VK SOTA stations in May, and 15 in April. All other months I have made a total of 4 VK contacts from here in AZ. 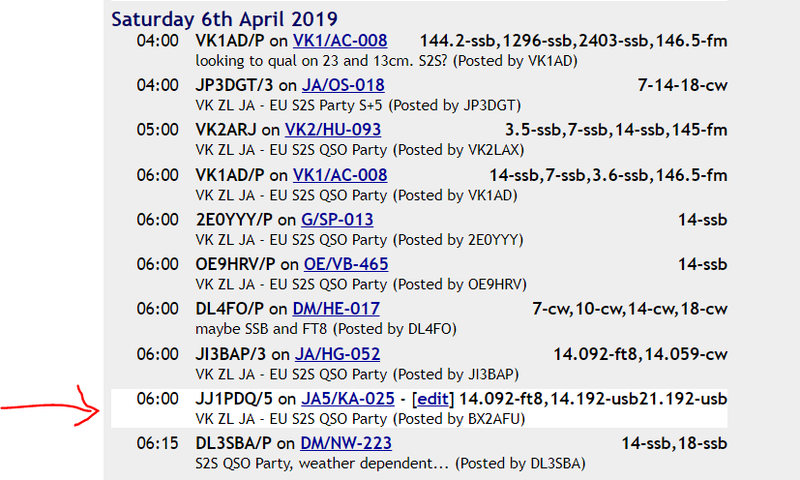 Two s2s contacts with VK2IO in April on 17 and 15 meters…CW. Isn’t that known as a Lazy L? I’ve heard of a “Lazy H”… Lazy L is a new one on me! You antenna sounds similar to my Buddistick clone. Just the element lengths are different as the “hot” element in mine is loaded on 20m. Yes, I’ve heard of Lazy H but I’m sure there’s a Lazy L as well. I’d go an do some Googling but I’ve got an MT meeting to attend where we’re going to plan which of you know who’s threads we’re going to shut down next. I think it’s known as “burlesque”. I didn’t know what a “Buddistick” was but that nice Mr Google provided the answer and yes it would appear to be a multiband version of my upper and outer with a loaded vertical section. The latest iteration of my antenna uses 4mm banana plugs to connect the elements to the centre, so I could easily fit ones cut for other bands. Or even make a linked version! Sorry to hear about the fall Mike. Could I recommend a groundplane antenna as a possible way forward for you? Very easy to make, very lightweight to carry, but still has the main benefits of the Antron. Four quarter-wave pieces of wire, a length of coax, and a fishing rod. It will spare you a lot of weight without losing a lot of DX. I think we’ve just found our 2019 Challenge! Thanks for organizing this party. I have passed the information on to OMs in Taiwan (BV stations). SOTA is still a pretty new activity in Taiwan but I am looking forward to participating the party for sure. Speaking from personal experience. Here in Europe, Taiwan is a fiendishly difficult DXCC to work from a SOTA summit. Back in September 2011, I worked it from G/SP-004 Shining Tor. To this day, I’ve never heard it again from a summit. Any Taiwan station activating a summit during the party, would be a big target for Chasers. I will be in Japan then, so I will “join” the team JA. JJ1PDQ is my Japanese call sign. Will see you on air. Saw this thread and I will be QRV from SM/DA on 20 meter CW. Hope to make my first VK/ZL and JA SOTA QSO. I never had a JA, VK or ZL SOTA contact. So i’ll take my chance. Don’t know which DM/BW summit. I’ll let you know by alert. Unless something comes up, I’m in as M0HZH/P from the closest summit, G/CE-005. 5W and GP vertical, FT8 and SSB.